Ritual is popularly associated with ceremonies, though in real life it plays a significantly more important role, reinforcing what people perceive as the appropriate moral order of things, or challenging what they perceive as the inappropriate flow of events. This book introduces the reader to how people use ritual in interpersonal interaction and the interface that exists between ritual and politeness and impoliteness. As rituals have a large impact on the life of people and communities, the way in which they use politeness and impoliteness in a ritual action significantly influences the way in which the given ritual is perceived. 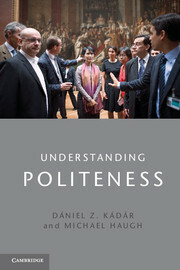 Politeness, Impoliteness and Ritual examines this complex relationship by setting up a multi-layered analytic model, with a multidisciplinary approach which will appeal to interaction scholars, politeness researchers, social psychologists and anthropologists, and moral psychologists. 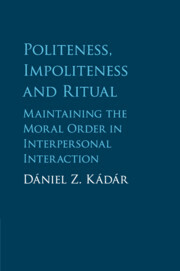 It fills an important knowledge gap and provides the first (im)politeness-focused interactional model of ritual. Dániel Z. Kádár is Professor of English Language and Linguistics and Director of the Centre for Intercultural Politeness Research at the University of Huddersfield. He is also Research Professor of Pragmatics at the Research Institute for Linguistics of the Hungarian Academy of Sciences. He has a long-standing interest in linguistic politeness research and ritual studies, as well as historical and intercultural pragmatics. He has published more than twenty books with Cambridge and other international publishers, as well as many papers in high-impact journals. His recent monographs include Understanding Politeness (with Michael Haugh, Cambridge, 2013) and Relational Rituals and Communication (2013). He is Editor of the Palgrave Handbook of Linguistic Politeness (with Johnathan Culpeper and Michael Haugh, 2017).